We offer agriculturally based internships in regenerative living in our farm setting. Please contact us for more information. Pono Grown Farm Center builds conscious community through connecting individuals to the land, creating a culture that grows peacefully and harmoniously. 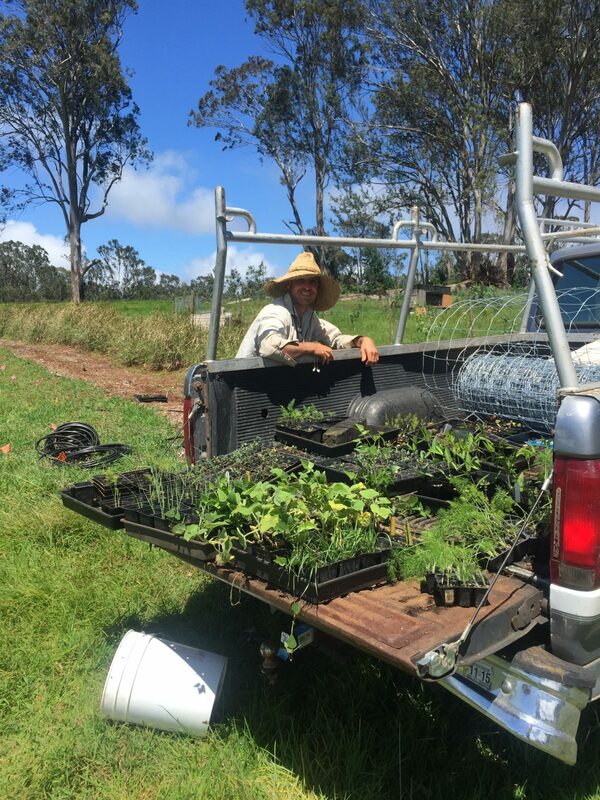 We are farming on a 15-acre site at 2000 feet in elevation 3 minutes from the town of Makawao. We began homesteading the land in 2013, building our home, barn, and other infrastructure, including water catchment systems and solar power. We began planting the land in 2015 and have hundreds of trees (mostly fruit trees) planted, and began vegetable production in 2016. Currently we sell at the farmer’s market and to restaurants. Our plans include an onsite farm stand, you-pick gardens, a CSA, farm lunch tours and a cafe. We offer our site for workshops, student groups and non-profit organizations to gather and learn. Our residential interns offer 20 hours per week of trade. We work Tuesdays and Wednesdays 9am- 4pm (with an hour off for lunch) and harvest on Fridays from 1-5. For the remaining 4 hours, everyone is on their own schedule which may include working on the land, helping at the market on Saturdays, kitchen cleaning, or animal and nursery care. Every intern has their own bedroom with a bed and shelves, interns share the kitchen, which has wifi internet, a composting toilet and an outdoor shower. We require less hours than other farms because we do not offer much food, though some vegetables are available from the gardens, and eggs and honey are often available for a reduced price. One load of laundry a week is included. Everyone in the shared kitchen pays $20 a month towards common items, is responsible to keep the community space clean and tidy and has a kitchen chore that is separate from the 18 hours. We seek individuals for a 3 month minimum time committment (short stays are often possible depending on timing). We are looking for positive, caring, respectful, hardworking, and passionate folks who have a strong interest in agriculture. Good communication skills are required as this is at the foundation of good relationships and pono living. We encourage people to take good care of themselves through healthful body, mind and spirit practices. All of our internss begin with a 2 week trial to make sure it is a good fit for everyone. Please only apply if you feel that you are the type of person we are looking for and are interested in what it is we have to offer. Our diverse system of vegetables, tree crops, bees, nursery, water harvesting, and solar power offers a unique environment for learning and understanding how everything is interconnected. We want everyone who comes here to use what they learn to better the world in their future work. Farming is hard work and is not always pleasant, joining us requires maintaining a positive attitude even when the work is not desirable. We infuse a prayerful energy in all of our interactions with this land and our community, embodying pono in all ways so that all who come to this land and eat from it can be well nourished in body, mind and spirit. No tobacco, drugs or alcohol. Evan has been farming since 2000 and is a permaculture teacher and designer who teaches workshops and implements farm systems throughout Maui. Extra paid work is often available for the right people interested in working hard and learning with him. Pono Grown Farm Center is designed to be an education and mentoring center that supports reconnecting individuals to the earth so that we can better care for the earth in all facets of our culture. Agriculture is the metaphor we use to teach this. If you are seeking to learn and grow and be a better person in service to the earth and all that inhabits it, then this could be the right place for you. We can get a fair amount of rain here and it can be cold as well as hot and sunny. Please come prepared for the weather with a good raincoat and proper close toed shoes for working. You will also need to provide your own bedding, towels etc. Mahalo for your care in the work that we are doing. Many blessings to you!